Most folks want to wind down once they’ve reached their golden years. Takao Arayama, however, wanted to go up in the world — as far as the summit of Mount Everest, no less. Many people dream impossible dreams, but in May, at age 70 years and 225 days, the retired steelworks engineer and father of two finally reached the 8,850-meter summit of the world’s highest peak. Although he had been a recreational mountaineer all his life, Arayama said he never set out to break the previous Everest age record held by countryman Yuichiro Miura, who in 2003 reached the summit at age 70 years and 222 days. In Arayama’s case, he insists, it was simply a question of his climbing-tour schedule. But did the record turn him into a hero, some kind of symbol for Japan’s aging population? All modesty aside, to climb Everest — which majestically straddles the Nepal-Tibet border in the Himalayas — is to put life at the mercy of nature. Temperatures, with added gale-force wind-chill, can be dozens of degrees below zero even in May, which is one of the best climbing months. Added to the risk of frostbite, which may necessitate amputation to avoid gangrene, the scarcity of oxygen in the air at such altitudes is not only taxing in the extreme but can also be fatal. 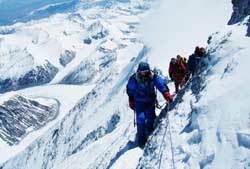 All that, and the inherent dangers of climbing, have claimed the lives of around 200 climbers on Everest to date. But Arayama was not unprepared. For one, he was outstandingly fit for his age, with “a slight weakening of the knees” his sole ailment. And he’d had plenty of practice scaling high mountains since he started to do so (get this) in his 50s. In his early 50s, for instance, he climbed the 4,478-meter Matterhorn in the Alps on the Swiss-Italian border. Then, in 1999, around the time he retired at age 63, Arayama scaled 6,194-meter Mount McKinley in Alaska, North America’s highest peak — followed the same year with a successful ascent of the world’s sixth-highest mountain, 8,201-meter Mount Cho Oyu on the Nepal-Tibet border. It was then that he resolved to climb Everest. “I thought, ‘Let me give it a shot,’ ” Arayama recalled during a recent interview at his home in Kamakura City in Kanagawa Prefecture just south of Tokyo. 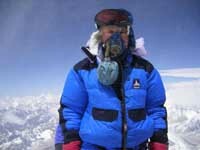 For one, Arayama continued to hone his skills, climbing 6,959-meter Aconcagua in Argentina, the highest mountain in the Western Hemisphere, at age 65. But just as important, he also had to find a tour agency that could accommodate his eating tastes. “On long mountain climbs, I sometimes crave Japanese food,” he explained. With that hurdle at last overcome, and the 6 million yen tour fee paid, Arayama finally packed his bags and departed for Everest on April 15. At whatever age, though, a person’s lungs don’t adapt to oxygen deprivation overnight, so to acclimatize, Arayama and his 10 or so fellow climbers — including a fiftysomething Osaka taxi driver, a 66-year-old retired photographer and several local guides — spent almost three weeks hiking up and down the mountain’s lower flanks. Finally, everybody’s diarrhea and headaches eased and the party was ready to shoot for the top. The support team waited for the right weather conditions. 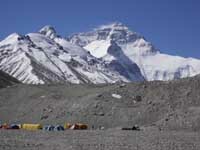 Then, just before noon on May 14, they gave the word and the climbers set off in a blinding snow blizzard. That first day’s push took them to 7,800 meters, then the next day (after a night spent in a tent pummeled by the wind) saw them reach 8,230 meters. After a brief rest stop there, the final assault on the summit involved a grueling, step by lung-bursting step, 11-hour trudge along a harrowingly narrow path. Anyone who slipped there might be saved by the safety rope linking the party’s members. But they might well not, and anyhow the effort to climb back or be hauled back up might even then be simply too much. Nobody ate anything. Ideally Arayama would be drinking lots of water, but “it was too much trouble to remove the oxygen mask,” he said. Even his 7-kg load of oxygen tank, water and clothes was a burden. “It takes everything you’ve got to stay alive,” he said. Finally, on May 17, the team stood on top of the world. 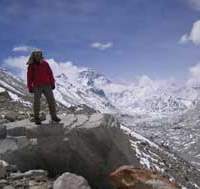 The sky was clear as they admired the view and took photos in the minus-20-degree cold, but storm clouds approaching from Nepal cut the stay short, and Arayama would have to wait until returning to base camp to ponder the scope of his accomplishment. “It was only there that I said to myself, ‘You really did it!,’ ” he recalled with a twinkle in his eyes. 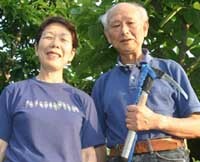 Back in Japan, Arayama stays in shape by jogging once a week and also once a week lugging a 20-kg backpack of water bottles around hills near the Kamakura house where he lives with Keiko, his wife of almost 40 years. But what is there to stay in shape for after Everest? Arayama said he’s now considering trying to scale all the “Seven Summits” — as the highest peaks on each of the continents are known. Having already bagged four of them, for him that might not be too hard. But Keiko, who overheard the Seven Summits talk, may be a tougher nut to crack. 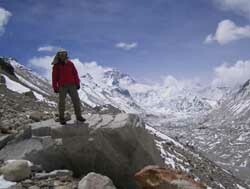 “He said Mount Everest would be the last, but it sounds like he’s planning something else. Well, he hasn’t got permission from me!” she said with a laugh.